If you don't know what a Hushed Hogfather Event is, let us explain. It's a Secret Santa type event. What's a Secret Santa event? Some offices used to run them every year. You get the name of a colleague (who you may not know very well) and you get to make / purchase them a small gift. The present goes into a sack and because everyone takes part, you will receive a present from the sack bought just for you by another work colleague. It could be anything from a rubber duck to a diamond bracelet. The challenge has always been to give something that everyone will like. There is usually a budget for each gift to ensure balance. The difference between an office Secret Santa and Discworld Monthly's Hushed Hogfather is that the Hushed Hogfather event is done by post (rather than at the office party) and everyone is a Discworld fan. So it should be easy to put together a parcel for a Discworld fan? Yes? Maybe? No? Last year, the best parts of the Hushed Hogfather event were seeing what everyone got as their present, hearing from the senders about how much fun they had choosing the gifts and how much the recipients enjoyed receiving them. Everyone posted photos of their presents on our Hushed Hogfather Facebook album. This year we will be asking you to send your photos to the Hushed Hogfather team via email and the photos will be put in an album on our Facebook page. To take part please register via the special Hushed Hogfather email address – we are only accepting registrations via this email address, you cannot register in any other way. The closing date for registration is: 21ST OCTOBER 2016. Once you've registered, there will be a waiting period. The team have to wait until after the closing date for registration before they start telling you who you have to send a Hushed Hogfather parcel to. Once we get to the closing date the Hushed Hogfather team will allocate senders and receivers based on your preferences and you will then receive a single email from the team telling you: the gender, age range and general location (ie country) of your recipient. You will not get their address at this stage! You will have 21 days to put together your parcel. (Please read the Bad Parcel/Good Parcel list for ideas.) As soon as you have your parcel ready to send, you need to email the Hushed Hogfather team a photo of your parcel. Once the team have seen the photo of your parcel, you’ll be given the address to send it to. Where possible, please remember to keep the name of your recipient and your own name secret. Then you have to actually send the parcel! Make sure you get proof of posting just in case anything goes missing in the post. We all appreciate that this time of year is expensive, which is why we have a suggested maximum spend value for all Hushed Hogfather Parcels. This makes it affordable for all to take part. This year the suggested Max Value is: 10 GBP / 13.30 USD / 12 EUROS / 17.50 AUD or 17.25 CAN (or whatever 10 GBP translates to in your local currency). The Hushed Hogfather team suggest that postage is not included in this value so please remember to consider postage costs. If at any point you feel you cannot send your gift please get in contact with us as soon as possible and we’ll reallocate your recipient so they don’t miss out. Bad Parcel / Good Parcel. Last year there were some issues with items being sent to people that were not suitable, so this year the team have created a list of items to advise you on what is suitable for a Hushed Hogfather parcel. Food stuffs - food items can go off or cause problems due to allergies etc. It may also be illegal to import food into some countries. Alcoholic items - there are lots of reasons why alcohol could be a problem (we are sure you can work out what they are). Heavy items - postage will be expensive if your parcels contain heavy items, especially if sending to foreign climates. Home made items - we loved seeing all the awesomeness that you can make at home and we know, from experience, the recipients love them too. In fact they are probably some of the best items we have seen in Hushed Hogfather parcels. Small items – items which are easy to safely send in the post. Anything that doesn't belong to the Bad Parcel list (for example: books, artwork, cuddly toys etc etc etc – it really is up to your imagination). The closing date for registration is: 21ST OCTOBER 2016. Read all of the above. 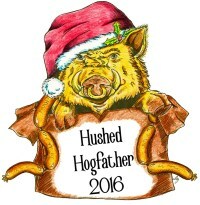 The Hushed Hogfather is all about having fun sharing a bit of seasonal cheer. Last year was brilliant fun – let’s make this year even better. Copyright © 2016-2019 Discworld Monthly.